Angelica Kauffman looks out from Johan Zoffany’s familiar 1772 group portrait of the newly founded Royal Academy, its members gathered as if preparing for a life class. She appears, however, not as a living person, but in the form of a painting – a weirdly unframed portrait that hangs high on the rear wall, alongside that of her fellow Academician, the flower painter Mary Moser. Their relegation to this marginal status has been a bait to successive gender-conscious art historians. For if Moser and Kauffman (1741–1807) were among the first members of the new Academy, they were also its only female members until Laura Knight’s election as late as 1936. Kauffman is later portrayed again, with Moser, looking out from the background of Henry Singleton’s 1795 portrait of the gathered Academicians, this time in person. Her image proliferated during these and later years, in both the prints of these group portraits and her own pictures, which frequently featured her likeness as either literal self-portrait or in allegorical guise. These were in turn copied and further multiplied, mutated and mutilated as decoration, illustration, or on ceramics. Hers was one of the most famous faces of the day. The woman herself travelled. Born in Switzerland in 1741 to an Austrian father and Swiss mother, she moved to Italy with her family when she was an infant. She spent a period in Austria before returning in 1759 to Italy, where her prodigious artistic and musical abilities started to gain notice. Her choice between these arts was later dramatised in an imposing self-portrait from 1794. She committed to painting and went to London in 1766, just as Britain, flushed with nationalistic pride after military success in the Seven Years’ War (1756–1763), was asserting itself as a centre equally of empire and of culture. While in Rome, Kauffman had attracted patronage from wealthy Britons who were on their Grand Tour and in search of trophies to signal their taste and learning. They posed for her with the remnants of antiquity and at least pretended to understand her classically themed paintings. In Britain their patronage continued, her friendship with the English painters Nathaniel Dance and Sir Joshua Reynolds – both founding members of the Royal Academy, and the latter the new Academy’s original President – helping to secure her success. There was controversy and criticism, often centred on her personal life as much as her art, but her paintings, especially her history paintings, were generally highly regarded. Kauffman left England in 1781, going back to Italy with her new husband, the Italian-born decorative painter Antonio Zucchi. But her British connections endured. It was for a British patron that she produced her largest single painting, the life-sized Religion Attended by the Virtues c.1799–1801. Although she continued to work until her death in Rome in 1807, this painting may properly be considered as a final triumph, the kind of high-minded allegory that the most ambitious artists of the age aspired to produce. Its subsequent fate is telling. The original owner, James Forbes, left it to the British Museum in 1835 in anticipation of the creation of the National Gallery, which opened in Trafalgar Square in 1838. The work, however, received little notice and at an early date was transferred to the National Gallery of British Art (which opened in 1897 would become the Tate Gallery). Clearly regarded as of secondary interest, the painting was sent off for display out of London – in this case, Plymouth – by 1913. It was hanging in the Guildhall, Plymouth during the terrible firebombing in March 1941, which destroyed that building and its records. In a post-war audit, it took months for curators at Tate to trace what had happened to this by-then forgotten canvas. All that survives is the contemporary engraving. So what remains of her now in the national collection of British art? A painting of a classical subject in her style, but quite certainly not by her, and a small portrait of a still unidentified female sitter. There are important pictures elsewhere in the UK, but, given that she was one of the most celebrated artists of the day, Kauffman remains woefully underrepresented. Will this situation change? Her kind of classical, narrative painting may not be sufficiently individualistic in style or politically oppositional enough in its content to attract great attention from a contemporary perspective. She may seem just too aristocratic and conventional. 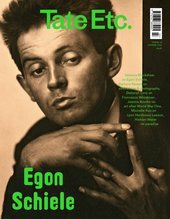 In her seminal essay, ‘Why Have There Been No Great Women Artists?’ from 1971, the late Linda Nochlin drew attention to the marginalisation of Kauffman in art history. 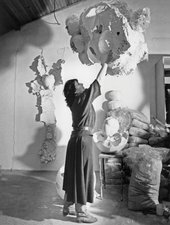 However, her response was not to propose quotabased representation for women artists nor only to reclaim heroic individual lives, but to pose wider sociological or institutional questions. She asked, critically, how many artists were the children of artists. Four decades on, we are hardly better informed on that question. Kauffman may have been a prodigy, but her father was also an artist, while her family travels and connections gave her privileged access to the art world. Like other prodigies over history, her achievement was by no means as spontaneous as might first appear. With that in mind, we might review the notorious sort-of-exclusion from Zoffany’s portrait as also a kind-of-inclusion. The case of Angelica Kauffman may not readily answer a present-day need to uncover defiant heroes from the past, but it may yet prove no less challenging to our values and expectations. This year marks the 250th anniversary of the foundation of the Royal Academy of Arts. 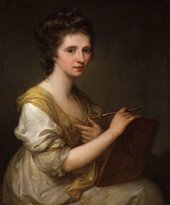 Angelica Kauffman: Royal Academician, Tate Britain, 18 June – 21 October. Martin Myrone is Senior Curator, British Art to 1800 at Tate Britain and curator of the Angelica Kauffman display.